"This is all out war on a massive scale," reads Bungie's official description of Combined Arms. "Guardians fight to survive in vehicular combat. Form up into Fireteams of six. Drive towards supremacy and glory. Watch for increased Heavy Ammo drops!" It's not exactly turning the game into Battlefield. Combined Arms matches are still focused battles between two small teams. Still, if you were hoping for more vehicular combat out of Destiny's multiplayer, here you go. The Combined Arms playlist will supplement the existing four game modes of Crucible. You'll have until September 21st to play it. After that, Bungie will remove the playlist from the game. There's a good chance you'll see Combined Arms again, though. They announced today that they'll be bringing back Salvage later this month. Salvage, a game mode that challenged teams of three players to capture relics, was initially available last weekend. Next month, meanwhile, will bring the Iron Banner playlist. You may remember it from Destiny's beta. The big difference between Iron Banner and other Crucible modes is that your equipment actually matters in Iron Banner. A player that has put a lot of time and effort into getting the best gear will be at an advantage in these matches. Bungie's not neglecting the PvE crowd, though. The next event on the calendar, the Queen's Wrath, will give players new Bounties and mission modes to tackle in co-op. They'll earn unique Rare and Legendary equipment by doing so. 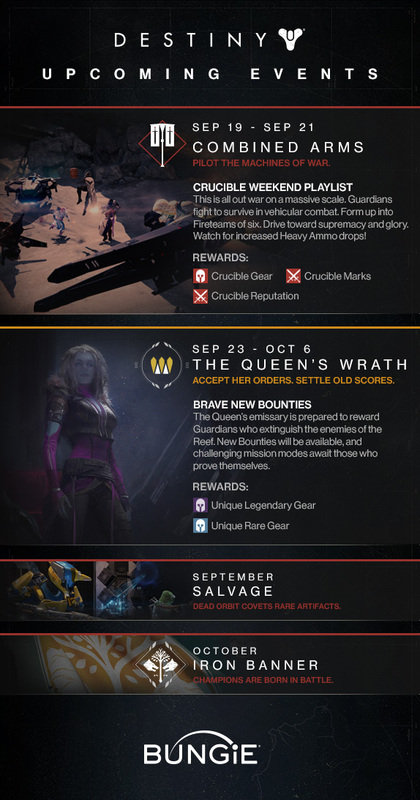 Queen's Wrath will be available from September 23rd until October 3rd. The development team is rolling out permanent additions to the game over time as well. Earlier this week they introduced Vault of Glass, the first 6-player Raid in the game. Vault of Glass is intended for high-level players and can take several hours to complete. Like Iron Banner, Raids are a way for players to make use of the advanced equipment they've been accumulating. Destiny launched on PS4, Xbox One, PS3 and Xbox 360 on September 9th. I was personally disappointed with the small amount of content available to players at launch. I'm pleased to see Bungie introducing new events on a weekly basis to give players new reasons to play. I hope that they can keep this pace in the months ahead. The key to any MMO's success is a steady stream of new activities.